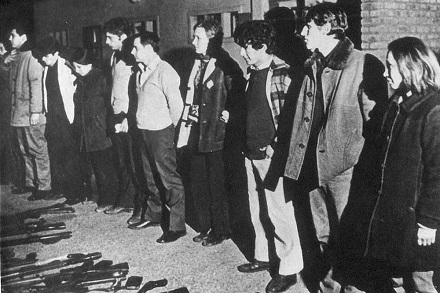 On this date in 1972, Argentina’s junta authored the extrajudicial execution of 16 political prisoners after a jailbreak attempt. Remembered as the Trelew Massacre (English Wikipedia entry | Spanish), it’s been back in the news for an Argentine court’s 2012 conviction of executioners Emilio Del Real, Luis Sosa and Carlos Marandino for crimes against humanity. One week to the day before those 16 crimes, more than 100 captured guerrillas from both leftist and Peronist movements attempted a mass breakout from Rawson Prison. The plan was to rendezvous with some well-timed getaway drivers who would whisk everyone to the airport where a flight waited to carry them to Salvador Allende’s Chile, which was then still a year away from its own military coup. Between drivers failing to turn up and others arriving late to the airstrip the operation was a logistical catastrophe. Six people actually managed to escape abroad;* nineteen others, having made it to the airport but missing the flight, salvaged what they could be summoning a press conference and surrendering without resistance. They hoped to protect themselves by putting their case into the public eye. Navy Lt. Commander Luis Emilio Sosa took the would-be fugitives to a naval base near the port of Trelew — not back to Rawson. In the early hours of the morning on August 22, all nineteen were awoken, lined up, and machine-gunned by a detachment commanded by Sosa and Lt. Roberto Bravo. Twelve died on the scene; the others were dumped in the infirmary where four more succumbed. It would be put about, as usual, that the murdered prisoners had been shot trying to escape but that story didn’t convince many people. From exile, Juan Peron decried it as “murder”; protests and guerrilla attacks occurred on the anniversary of the slaughter for the next several years. Sosa and Real both died just a few weeks ago, in July 2016. Beyond the three men it convicted for the Trelew affair, Argentina has also appealed unsuccessfully to the U.S. to extradite Lt. Bravo, who has been living comfortably in Miami since 1973. * These escapees went on to various interesting — and often violent — fates in revolutionary Latin America. One of them, Enrique Gorriaran Merlo, would eventually help to assassinate exiled Nicaraguan dictator Anastasio Somoza. So, if terrorists escape, killing two guards, … the state is not allow to punish them ? In the late 1980s I was working with a young man from Peru. I was not yet 30 and he was much younger than I was. We stoped in a Peruvian Resturant on Sligo Creek Parkway for lunch on a hot summer day. While we were waiting for our food I asked him Paco, that is surely a nick name what is your real name. Well to make a longer story short, He said Fransica or Francheska something like that. I said Paco I do not speak much Spanish but I know enough to know that that is a girls name. Did you not get tormented in school with a girls name. He said only until I told them why I was named after my aunt. The police came to my mothers house when she was not at home and my sister pretended to be my mother, so my aunt was arrested. I said Paco I do know something about the history of Peru and Peru did not have those kinds of troubles when you were born. He said, yes I am from Peru but my mother is from Argentina.